UU A Way Of Life: Knowledge or wisdom? Unitarian Univeralists covenant together to affirm and promote the responsible search for truth and meaning. Where does this responsible search take them? If it takes them down the road of more information, opinion, belief, and factoids, this leads them to what Stephen Colbert calls "truthiness." "Truthiness" is, of course, not real Truth nor even deep meaning, if by deep meaning we mean wisdom. There is a difference between knowledge and wisdom. In our modern internet age, Google has made knowledge available at our finger tips, but Google does not provide wisdom. 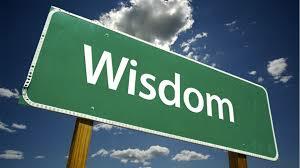 Wisdom comes from another place than just the accumulation of knowledge. In the age of Google there are more and more educated idiots and fewer and fewer wise people. Unitarian Univeralists know that knowledge does not make us wiser and holier. Unitarian Universalists covenant together to affirm and promote the respect for the interdependent web of all existence of which we are a part and it is in this respect that we approach wisdom. Wisdom is more a matter of the heart than the head. Wisdom is an appreciation of context. Wisdom is the ability to put things in perspective, to prioritize, to paradoxically take things one thing at a time and yet to appreciate the whole. Wisdom is the awareness that the whole is greater than the sum of the parts. Wisdom is not merely having knowledge, but having knowledge and knowing what to do with it.